The G-Panel provides a helpful tool for PC gamers to monitor the graphics adapter information/status on a 3.12" LCD display. An extra USB 3.0 type C port and USB 3.0 type A port are provided on the panel. GameRock Stylish Backplate is designed with high protective function in mind that prevents damage of the graphics card if the card suffers from any physical impacts. 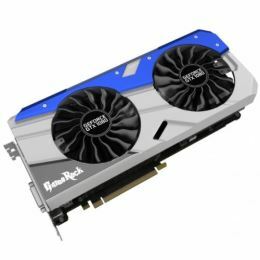 GameRock’s unique style appearance allows gamer to enjoy top quality GameRock graphics card series. The new GameRock cooler design adding 22% more fin and large size copper base directly adhered with GPU and heatpipes, performs a lot better than previous design. The 8 phases for those 2560 cores provides unlimited power and minimized current loading for each phase to stabilize the voltage level , the overall efficiency can be improved, the choke noise and EMI noise also be reduced. DrMOS, originally only available for high-end server CPUs, is now a..